This week, Pam Allyn's interview is featured on Mom Enough, the website portal of mother-daughter co-hosts, Marti and Erin Erickson. Pam joins in to talk about simple but powerful ways to engage your child – tot to teen – in putting ideas on paper, starting with a toddler’s scribbles or drawings and building toward clear, concise expression of feelings, concepts and logical arguments. This is all about empowering your child to use the written word creatively and effectively. To what extent do you think technology (including texting and tweeting) helps or hinders good writing? Whatever the age of your child, what could you do at home to support writing while keeping the fun and excitement in it? View more and listen in on Mom Enough HERE. 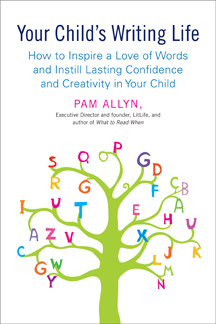 Newer PostPam Allyn at the World Literacy Summit in Oxford, UK!